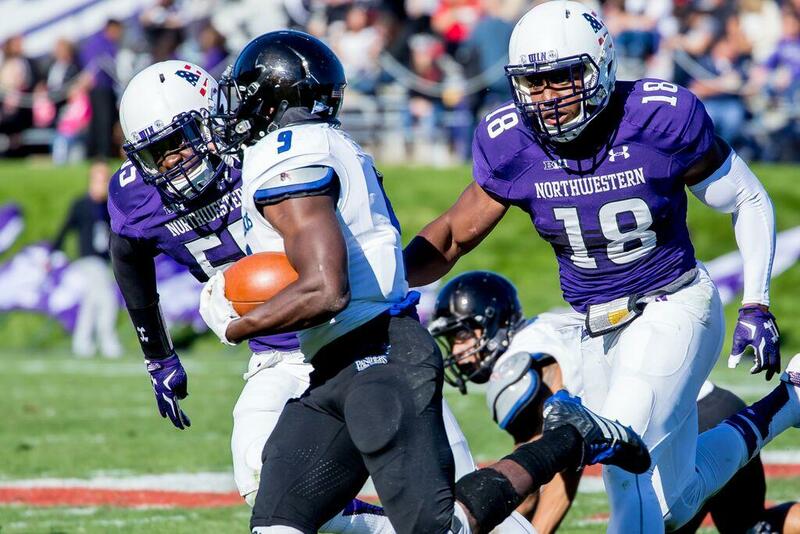 Anthony Walker (18) chases a ball-carrier during Northwestern's win over Eastern Illinois. The sophomore linebacker recorded seven tackles in the game, bringing his season total to a team-leading 17. Late last fall, with Anthony Walker only several weeks into his tenure as Northwestern’s middle linebacker, coach Pat Fitzgerald asked the redshirt freshman whether it “felt like high school” yet, in terms of Walker’s comfort on the field and ability to diagnose offensive play calls as they developed. In 2014, Walker was an inexperienced fill-in, pressed into duty by starter Collin Ellis’ persistent concussion woes. He had some bright moments — eight tackles and an interception-return touchdown again Penn State, most notably — but also struggled with less visible aspects of his position, like filling holes and occupying blockers. Less than a year later, Walker looks like a star. The sophomore was the best player on the field in Northwestern’s 16-6 upset over Stanford on Sept. 5, materializing in front of seemingly every Cardinal ball-handler on his way to 10 tackles (including three for losses) and a Big Ten Defensive Player of the Week award. Walker fits right in, hurtling toward ball-handlers and celebrating exuberantly when he gets to them. The South Florida native stands at 6 feet 1 inch, 235 pounds, with a thick, athletic build that would fit at almost any position. As a middle linebacker, his job is to be menacing, and he plays the part well. Off the field is a little different, says Walker’s friend and classmate Godwin Igwebuike. Walker presents a gentle demeanor and easy smile, and Igwebuike says the linebacker used to keep to himself, “sticking to his room playing (NBA) 2K all day” but eventually emerged as one of the “silliest” players in the class. Walker has had to leave his shell to play middle linebacker, a position sometimes called the “quarterback of the defense.” Despite being NU’s youngest starting linebacker and one of the team’s least-experienced defensive regulars, the sophomore has been a willing leader. “Anthony feels much more comfortable being out in front of the group, really being the guy who says ‘follow me,’” Fitzgerald said. Bates commends Walker, whose father is a former coach, on his ability to quickly process football’s intricacies and likens Walker’s skill set to that of former NU, Chicago Bears and Oakland Raiders middle linebacker Nick Roach. Given Walker’s performance over the first 14 games of his career, such a lofty comparison might not be hyperbole. The former three-star recruit out of Monsignor Edward Pace High School in Miami Gardens, Florida, has quickly developed into one of the top players on a defense that could be the best of the Fitzgerald era. And with two more seasons in Evanston after this one, Walker could become one of the premier players to come through the Cats’ program in recent memory. But there certainly remains room to grow. Fitzgerald, himself a former linebacker, was hesitant to praise Walker last season even after the Penn State game but said he’s been happy with his progress so far this year. Walker says the game is slowing down for him but college ball doesn’t feel like high school quite yet. When it does, the Big Ten had better watch out.